After rebounding from the group of upper fibo levels, Eurodollar started new descending movement. During current pullback, which has already reached local correctional level of 50%, I opened another buy order. In the nearest future, market is expected to reverse downwards and break minimum. 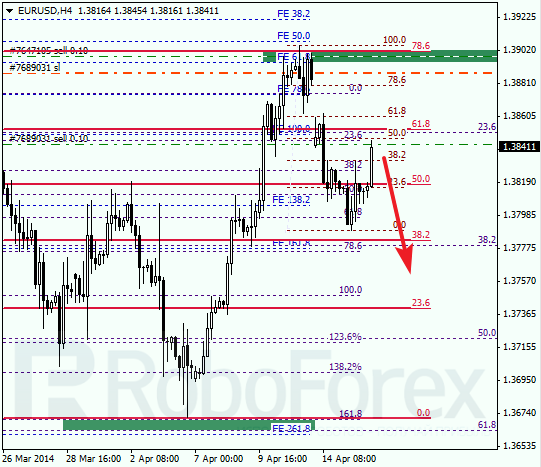 As we can see at H1 chart, pair rebounded from the group of upper fibo levels right inside temporary fibo-zone. Main target for bears is at local level of 61.8% (1.3760). If pair breaks this level, price will continue moving towards level of 78.6% (1.3720) to test it from above. order. Price may yet consolidate for a while, but later it is expected to break previous maximum. 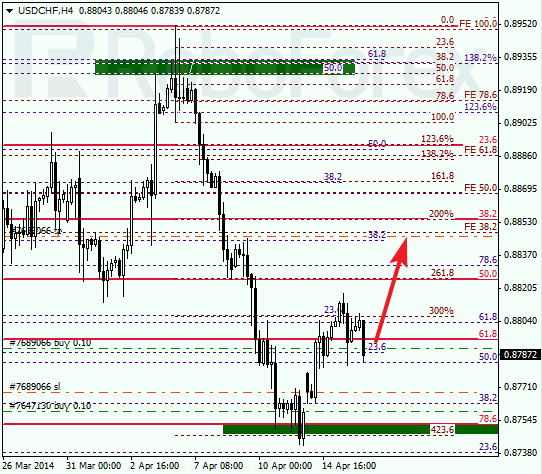 As we can see at H1 chart, possibly price may reach local correctional level of 50% (0.8780). If later price rebounds from it, market may start new ascending movement towards the group of fibo levels (0.8845 – 0.8855) near level of 50%.